I received just the jolt of inspiration I needed to pursue all I want to do and accomplish in 2010 last Sunday. It hit me watching the Indianapolis Colts lose a winnable game and the chance at a perfect record because their coach pulled quarterback Peyton Manning and other starters at half time when they led the Jets, replacing them with 2nd stringers. Manning has not slowed down at all - the coach just wanted to give him a couple more hours' rest before the last regular game of the season next week. After all, they're already in the playoffs, aren't they? And he wanted to protect them from the possibility of injury in the rough and tumble game. Play it safe. Problem is, we can all be injured simply walking across the street or slipping in the shower. Tripping on the stairs; most injuries occur in the home. The number of athletes injured off the court, field or diamond are legion. Manning said he wanted to go the distance to see if he could win that perfect - winning every game in the regular season - record. Manning said his team did, too. I'm not talking about taking ridiculous chances or being foolhardy - which simply wasn't the case. After all, they were playing the Jets. It was a winnable game within ordinary playing boundaries for the starters. Champions are champions. They courageously prepare and play when ever they can; they push forward despite what might appear to be insurmountable obstacles. Champions are not rewarded by pulling them out of the game; champions are rewarded by putting them in a position that tests every fiber of their being to see how far they can take themselves. That's what makes a champion - they don't have the limits the rest of us do, they make that extra effort; they take that extra chance; they leave the average performer in the dust because that's what they've trained their minds, their talents and skills to do. 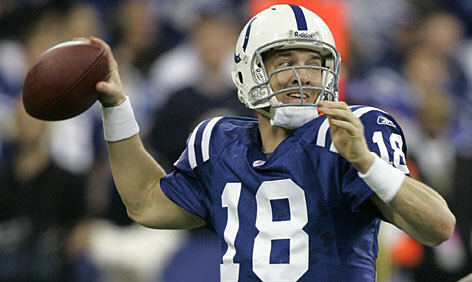 Mind you, I'm aware that Peyton Manning is not the best athlete in football. But he and his teammates are champions. They have a championship mentality and drive. They prepare themselves to use their strengths for their greatest good and limit the exposure of their weaknesses. Pulling a healthy champion from a championship performance or winning game is not usually personally experienced as something done in their best interest or the best interest of the team. In fact, it can play on the minds of some - intellectually understanding why the coach made the decision and being an obedient, respectful player for him/her, but viscerally confused and unhappy that a winnable game - and record - was lost. It's one thing to lose when we've put our very best work forward, another to lose because the coach decided it was OK to throw the game. Now we'll never know if the Colts - Manning and his starter teammates - could have put an undefeated regular season notch in their long list of record-breaking achievements. In my life, I want to know. I want to know if I can do it. I don't want to be pulled from the game for fear I might get hurt because I am fit. I've prepared and trained, I'm in terrific shape and have been playing a winning game fearlessly and effortlessly, accommodating my strengths and weaknesses, doing my homework for each team's unique challenges. Most especially I don't want to be pulled if I'm playing the Jets. I want to go big or go home. I want to stay in the game and give it my all - 110% - to challenge myself, the other team and final score be damned, to see if I can pull it off. See if I can push myself to overcome those insurmountable obstacles to do everything I wish in the best way possible before the game ends. I'm not pulling myself on the sidelines to "play it safe" or let a challenging opportunity pass, knowing I'm prepared, ready, willing and able to do my best to the very end! 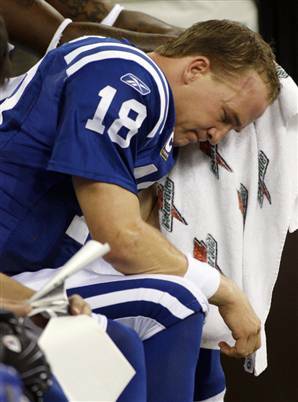 Lesson well learned, Colts coach, just in time for the new year - and the rest of my life. Happy New Year, Dearest Reader! May 2010 be your championship year!